Jeffrey Basham, who was one of the jousters featured in the commercial "Do Something Noble", was the winner of last year's Lysts on the Lake jousting tournament. Immediately following the tournament, Jeffrey was kind enough to answer some questions for an interview. However, due to a household emergency, I completely forgot about the interview until several months later. When I apologized to Jeffrey about not publishing it, he brilliantly suggested that I publish the interview as a lead up to this year's tournament. Lysts on the Lake 2014 will take place May 9 - 11 near Austin, TX, USA. For more information about the event, check out the Lysts on the Lake website. 1. When, where and how did you begin riding horses? Growing up I would occasionally tag along with my older brother and his family riding quarter horses on trail rides and watching him compete in rodeos. In 2010, my wife purchased an Arab, and I wanted to start riding again. I soon realized that my former riding experience wasn’t going very well onboard this dressage trained Arab, and if I was going to survive, I needed to take dressage lessons. 2. 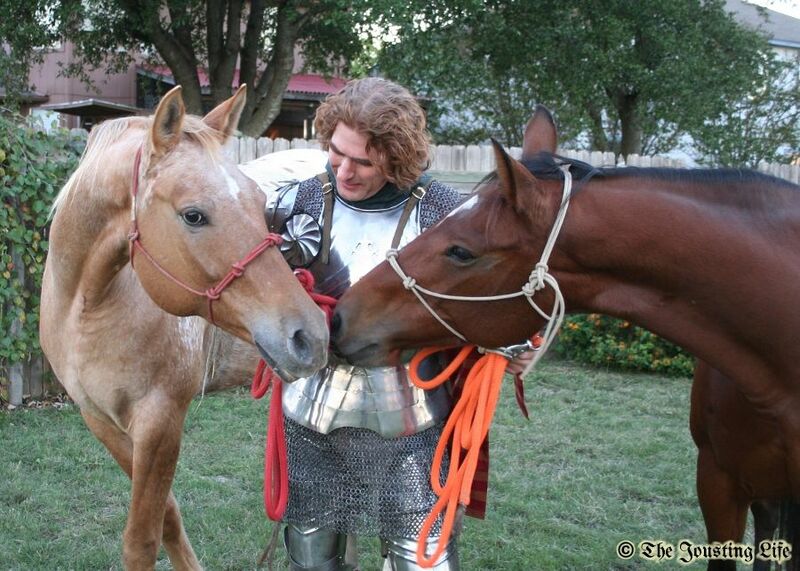 When and how did you become involved with jousting? A little more than a decade ago, I was very involved with Historical European Martial Arts (HEMA) and had the opportunity to train and teach with John Waller, Keith Ducklin and Andy Deane of the Royal Armouries (Leeds, UK). John Waller was an action arranger and historical consultant for stage and screen. He taught stage combat at drama schools and was the Head of Interpretation for the Royal Armouries. We developed a good rapport, and it was implied that if I wanted to learn to joust that I was welcome to come back for training. However, life and circumstances changed and I never was able to follow through on that offer. I’ve always regretted not making it back over to the UK. Fast forward to 2011 and a friend of mine, Dakao Do, informed me about a historical jousting tournament taking place in Austin, TX. We made a road trip to go an see what this Lysts on the Lake was all about. He knew a few of the participants and introduced me to Steve Hemphill, Scott Wilson, Dave Wise, Sean Gulick, and so many others. 3. When, where and what was the name of the first jousting tournament that you competed in? How did you do? I participated in the Tirocinium (novice joust) at Lysts on the Lake 2012 under the watchful eye and training of Luke Binks and tied for first in points. We won the novice melee and would later go on to win the main Mounted Skill at Arms division as well. 4. Tell us about your horse Pooh Bear. Where did you get her? How did she get that name? What other forms of riding do you do with her? Is there anything else you would like to say about her? She was green broke and hadn’t been ridden in almost a year. The lady who owned her at the time, Renee Oehl, was a former two time national champion in Western disciplines, and due to family and career commitments, she didn’t have time to dedicate to her training. Thus, she was looking to find Pooh the right person to give her a job and a good home. A few weeks later on Valentines Day, Pooh was given to me. That's right, given to me, a horse that is a descendant of two QH Hall of Famers. Best Valentines present ever! Because Renee’s daughter had originally named her “Pooh” we kept it, and later on I over heard Caren Wilder calling her “Pooh Bear” and that has stuck ever since. Under Keith Wilders guidance, we started out with natural horsemanship, specifically Clinton Anderson’s Down Under Horsemanship Method. Later, we moved onto Dressage. Today, we train under the mentorship of Pam Fowler-Grace in Classical and Western Dressage and practice jumping with Dev Branham. 5. Describe one or two of your most memorable moments related to jousting. My first pass during the Tirocinium at Lysts 2012... I took the lance, charged down the tilt breaking my lance, halting at the other end and smiling ear to ear. Then I realized I was gasping for breath! What - wait a minute - Pooh was the one doing all of the running! My adrenaline was flowing, I couldn’t get another lance in my hand fast enough and go at it again. 6. How do you feel about riding a Mounted Skill at Arms Course, as opposed to running each skill individually? I found the Chivalric Equitation Obstacle Course[a type of MSA Course] a blast, for it was more than just riding forward in a straight line and striking a target. It involved elements that included riding a 20 meter circle, a rein back and a jump, combined with the many of the more traditional skill tests you see in Mounted Skill at Arms. I fully support any move that adds emphasis to equitation skills along with martial skills. There are historical references discussing and illustrating the training of horses and riders from the 16th and 17th centuries that include working on circles (the most useful schooling figure of all), half circles, figure eights, serpentines, diagonals, lateral work (leg yields, should-in, haunches in, haunches out), jumping and more. These authors didn’t just invent schooled riding methods, they were carrying on and refining the traditions from earlier generations and centuries. They placed emphasis on the rider’s position and the elements of what we today term rhythm, looseness, contact, impulsion, straightness, and collection. To give respect and honor to those Lords, Knights, Cavaliers, trainers and masters of yesterday, so should we! 7. How was the mounted melee? I found that I was the competitor with the biggest set of cross hairs on his back! 8. How was your overall experience of Lysts 2013? We were blessed with good weather, great food, and amongst the best people I’ve ever met. I’m so looking forward to seeing everyone again. 9. Is there anything else you would like to say about the tournament? An event is only as good as the ground crew and organizers, and ours were outstanding! I really appreciate the ground crew, for these people do us such a big favor to take time out of their own busy lives and schedules to come volunteer and be part of the Lysts experience, and let us play knights in shining armour. Steve and Dawn Hemphill are two of the finest people I know. In the spirit of Texas hospitality, they opened their home and property to our invasion, provided a great meal plan, and handled all of the complications and burdens of planning and administration to make Lysts such a wonderful time for us all. A special note of renown goes to my fellow competitor, Scott Wilson, who loaned me his Appaloosa gelding, Tanner, so I could finish in the finals. It was just after the melee that we discovered that Pooh had thrown a shoe. My heart sank, after all if this hard work, it looked as if I would have to scratch. Scott spoke up and offered Tanner, and my saddle fit him as if it had been custom made for him alone. The Lady of Honor allowed me to make a couple of solo canters down the tilt, and on the first pass I shouted out to Scott that “this horse is amazing!” I had never ridden Tanner before. Two very experienced riders had previously told me what a great prospective horse he would be for dressage and/or eventing, and they are right! I’ve ridden over a dozen different breeds of horses including two former world and national dressage champions, and I attest that Tanner has the best canter I’ve ever experienced. At that moment my confidence shot up 110%, and I had my mind back into to being focused on the task at hand. Thank you Scott Wilson - you and Tanner made the difference for me. 10. In terms of jousting, where would you like to go from here? I hope to be part of many more tournaments like this for years to come and look forward to future travels abroad. Here in the USA - I’d like to compete in the Tournament of the Phoenix, and one day I'd like to be part of a historical tournament that is on the same caliber as The Grand Tournament of Sankt Wendel.